I'll never forget the first time I saw Connors play. 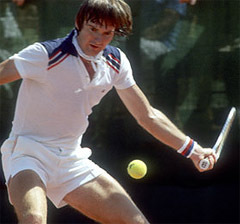 I'll never forget the first time I ever saw Jimmy Connors. I grew up in St. Louis and learned to play at a clay court club where a lot of the great St. Louis players like Butch Buchholz also played when they were young. One day when I was 9, I was on the way to the courts with my dad and he said on the way over, "You should see this kid Jimmy Connors. He's ranked three in the nation. He's going to be hitting today and I want you to take a look at him." And I'll never forget walking down the path to the little clubhouse and then seeing Jimmy on the court hitting there. Everyone at the club was watching, including my dad and some of the other men players. Jimmy was 12 years old and was on his way to the Nationals. People were saying things like "Look how deep he's hitting the ball." Trey Waltke was an elite American junior player from St. Louis, Missouri, who went on to a 10-year career on the professional tour, reaching a ranking as high as #40 in the world. Known for his graceful, attacking style and classic slice backhand drive, Trey had wins over most of the great players of his generation, including John McEnroe, Jimmy Connors, Stan Smith, and Illie Nastase. With partner Billie Jean King, he also won World Team Tennis Mixed Doubles Championship. Trey is currently the tennis director and general manager at the Malibu Tennis Club in Malibu California.